The New York Times and USA Today Bestseller She possessed a stunning beauty. She also possessed a stunning mind. Could the world handle both?Her beauty almost certainly saved her from the rising Nazi party and led to marriage with an Austrian arms dealer. Underestimated in everything else, she overheard the Third Reich's plans while at her husband's side, understanding more than anyone would guess. She devised a plan to flee in disguise from their castle, and the whirlwind escape landed her in Hollywood. She became Hedy Lamarr, screen star.But she kept a secret more shocking than her heritage or her marriage: she was a scientist. And she knew a few secrets about the enemy. 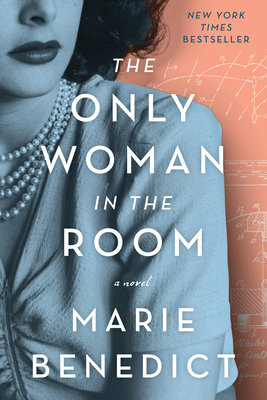 She had an idea that might help the country fight the Nazis...if anyone would listen to her.A powerful novel based on the incredible true story of the glamour icon and scientist whose groundbreaking invention revolutionized modern communication, The Only Woman in the Room is a masterpiece. Marie Benedict illuminates both sides of this complex woman's life in a way that only a gifted writer can, resulting in a glittering, spell-binding tale of glamour, intrigue and fierceness.... In a fun twist, I actually read this book on my phone. When I realized that I was holding some of the technology made possible by Lamarr's efforts, Benedict's story truly came to life for me. Who knew that we all would be so close to the most beautiful woman in films without even realizing it? Beautifully written, compassionately rendered and compulsively readable, THE ONLY WOMAN IN THE ROOM is the perfect work of historical fiction for our time. Benedict has done Lamarr true justice, and I feel certain that she would love this book. "The Only Woman in the Room" not only succeeds as a novel about a woman's search for peace with herself but also as an imagined glimpse of a decade in the life of a movie star whose contributions to the world are still felt today.... The author's ideas of what may have driven the actress's professional achievements are fully fleshed out, so that even as the terrorized Hedwig Mandl makes an improbable journey to becoming the world-famous Hedy Lamarr, the reader understands her emotional growth in the context of the novel.... Ms. Benedict's book brings new life to an old story, and fans should be tantalized by the possibilities of the as-yet-unexplored heroines she may bring to life in the future.